Who makes Oscar odds in Vegas, and what’s the best way to win a pool? Every year, countless newspaper, web, and TV stories run around the Oscars about who’s supposedly going to win, why they’re going to win, and what the year’s biggest “surprises” will be. Hell, even The A.V. Club weighed in this year. But who are these “experts” that make the odds, and how are those odds made? And how can we, as savvy pop culture gamblers, use these odds to win hundreds of thousands of dollars from our friends and co-workers by juking the annual Oscar pool? The A.V. Club talked to Benjamin Eckstein, writer and creator of America’s Line, a syndicated odds column published in over 120 North American papers, about what the odds mean, who bets on the Oscars, and who’s really going to win Best Adapted Screenplay. The A.V. Club: Who bets on the Oscars? Is it professionals? Is it amateurs? Benjamin Eckstein: When you say professionals, it’s not really professionals that bet on the Oscars, although there are some now. Let me just mention this right off the top: You cannot bet legally on the Oscars in Las Vegas or anywhere in the state of Nevada. They have a thing where they’re very, very careful. The Nevada Gaming Commission does not allow any bets or wagers on events for which the results are already known. PricewaterhouseCoopers, the geeks who come out every time with the briefcase, knows the results. Not that it ever leaks out, but it could. If it did, it could be a real black eye. AVC: They could bet on it themselves. BE: Exactly. That’s why they don’t take any bets on entertainment stuff. Now if you went over to England or Ireland or Wales or Scotland, they have literally thousands of brick-and-mortar betting parlors. You can walk into any of those betting parlors and place a wager on the Oscars. It’s not the biggest event wagered on when we talk about sports—that’s the Super Bowl or March Madness—but there is some action, and it’s fun. You can also wager from the Internet. You don’t have to fly over to England and walk into a shop. There are many places on the Internet you can place a wager. You just have to be careful and make sure that it’s okay to do it in the state that you’re in. All that stuff is still a very gray area. There’s not a ton of money that we can trace that’s bet here. The money that’s bet overseas is sometimes proprietary, and they don’t release figures. I would venture to say it’s not a huge amount of money. Where I think the money comes in is the private pools. I’ll make a bunch of analogies to the sports world. I hope you don’t mind. For example, for the Super Bowl, you have private pools. You take a box. The box is the final score. You walk into any place on Clark Street and do it, $25, $50 and the payout, accordingly, is a couple thousand. On Wall Street, the boxes might go from $5,000 or $10,000 with the payouts running into the millions. It’s the same thing with March Madness, the college basketball tournament. I wouldn’t say it’s the same thing with the Oscars. Although, if you extrapolate from your pool and a couple of people you know at The A.V. Club and The Onion, and my pool here in Vegas, and there are probably some places in Hollywood where a bunch of people get together and wager some substantial money. I don’t know that for a fact, but I’m making an educated guess. That’s where we’re at with the betting. A lot of people mistakenly think that you can walk into Bellagio or the Wynn hotel or the Tropicana or New York-New York or Mandalay or any of the hotels out here and place a bet on the Oscars. You cannot. Not going to happen. It would either be online betting if you happen to live overseas, or if you’re involved in an Oscar betting pool with friends, family, or co-workers. A lot of the entertainment sites have pools. It’s just fun and people don’t mind putting a couple dollars down and having some more fun. It makes it that much more exciting. AVC: Can you do prop bets on the Oscars in Vegas? Like on how long the show’s going to be, or how many celebrities will wear red dresses? BE: My friend and compatriot in the business is Johnny Avello, and he works at the Wynn hotel. We’re having a little party—or maybe it’s a big party—where he closes off the sports book. We’re going to show the Oscar telecast, and we’re going to have stuff where—again, it’s not monetary betting. We’re going to have some really fun wagers like the longest acceptance speech. We’re going to give away prizes for these various categories. Name six people that have died that will be honored on the in memoriam tribute. Fun things like that. Prop bets, we have fooled around with some of them. How many Oscars will Gravity win? Over-under two and a half Oscars. Things like that. Will so-and-so win X amount of Oscars? While there are not a lot of prop bets, there are a few we’re probably going to put out just for that little party. BE: Over the last number of years, we’ve done the top six major categories, which would be Actor, Actress, Supporting Actor, Supporting Actress, Director, and Picture. This year we’ve added two more: Best Screenplay and Best Song. Those are the ones that we’re looking at. How do we devise the odds for these and why is a certain picture a favorite? Again, let me go back to a sports analogy. Take football, for example: Say the Chicago Bears are playing the Green Bay Packers. We try to gather as much information as possible, because I truly believe, and I have since I started, that you’re only as good as your information. If you don’t have good information, you’re not going to be good, and you’re not going to set good lines or good odds. In this case, you’re not looking at past performances, like how did the Bears play three weeks ago, and how did they do up in Green Bay? Here, the information we’re gathering is kind of obvious. Who won the Golden Globes, who won the BAFTA, who won the guild awards? We’re taking a look at those. We establish odds at the beginning of the so-called awards season back in the middle of December. We put out what we call our opening odds, and they’re close to the odds that we have out now, but obviously once somebody wins a Globe or somebody wins a BAFTA, we tweak the odds. We mash them around a little bit and make sure that we have the proper people at the top of the list. To give you a quick example, for the opening odds for Best Actor we had Chiwetel Ejiofor as the favorite for 12 Years A Slave and we had Matthew McConaughey as the second choice. Obviously, now we’ve reversed that. We now have McConaughey as the first choice. We dropped Ejiofor to the third spot, and we moved [Leonardo] DiCaprio up to the second spot. There are tweaks and small changes, but for the most part the odds we put out in December are close to what we have now here. Fortunately, I’ve been doing this for 15 years and I have some very good and very close friends in some high places in the entertainment field. I can’t mention any names, but let’s say a director or two and an actor and actress or two that I’ve known for years just by doing what I do. They’re very, very helpful. We’ll sit down and go over it. AVC: Do you think in any way that these odds are a self-fulfilling prophecy? If everyone says, “Oh, everyone says 12 Years A Slave is going to win,” then maybe the Oscar voters will pick it, because they want to pick a winner. BE: That’s interesting that you say that. We have what I call—and I’ve kind of named it, nobody else cares about it, but I do and I have fun with it—I call it “put it on the seat.” So for example, this year Cate Blanchett, just put it on her chair before the awards ceremony starts. Last year, we had Daniel Day-Lewis, who we love. Whenever he’s nominated, you just put it on his seat. He was such a huge favorite that you wouldn’t even bother betting on him because there’s no need. AVC: You’d make 20 cents. BE: No self-respecting gambler would want to do that. If we want to just talk the top six categories, four out of the six would be put-it-on-your-seat categories. McConaughey is going to win Best Actor. There’s no question. Although I will tell you DiCaprio is coming on fairly strong from some of the people I’ve talked to and some of the voters. But McConaughey is still a very large favorite. Blanchett is an overwhelming favorite. Put it on her seat, no questions asked. Jared Leto, overwhelming favorite, put it on his seat, no questions asked. [Alfonso] Cuarón has won everything for Gravity. That’s another put it on your seat, no questions asked. The only one of the top six that I think will be kind of competitive is Best Supporting Actress. The way we have it right now, it’s very, very tight between Lupita [Nyong’o] and Jennifer Lawrence, even though Jennifer Lawrence won the BAFTA. We still have Lupita as the favorite, but only very slightly over Lawrence. That’s one of those that could go either way. I wouldn’t put it on either of their seats. The Best Actor, I’m pretty sure McConaughey is going to win. He’s a strong favorite, but not overwhelming like Blanchett and Leto. As for movie, 12 Years A Slave is a very strong favorite. Not quite overwhelming, but a very strong favorite to win over Gravity, which is our second choice. Then you go down into Best Screenplay, Best Song. There are some that are no contest. You don’t have to worry about it, don’t even think about it. These guys are going to win, like Best Costume Design, Great Gatsby’s going to get it, there’s no question. Best Adapted Screenplay, 12 Years is going to win that. Animated Feature is Frozen. They’ve already given them the Oscar. The screenplay is going to be close. That has gone back and forth. We originally had American Hustle as the favorite for the Best Original Screenplay, and now we’ve moved Her into the favorite role, but very slightly. You can virtually slip a piece of paper between them, and that’s how close it is. We’ve been doing this for 15, 16 years, whatever. Without fail, we’ve had at least five out of six hit every year. For some reason, it’s not that hard once everything is put into place. There are years we’ve swept the top six. For the most part, our percentages are pretty nice. Aside from having fun and enjoying it and getting a lot of ink about our odds, putting out something that does well and that I’m proud of is also very important to me. AVC: So, let’s say we’re doing an Oscar pool. The big six seem obvious, but how do you know, say, what the best foreign short is going to be? The best cinematography? BE: Documentary, The Act Of Killing should probably win, but Twenty Feet From Stardom is really close. That’s going to be a tough one. The Foreign Language Film is going to be The Great Beauty most likely. We have that as a pretty strong favorite. The Hunt would be the second choice, but Great Beauty is the one that should win. Costume Design, Great Gatsby is a no-brainer, off the board, don’t even bother with the others. Film Editing, Gravity should be an easy winner. We talked about Best Adapted Screenplay. That’s 12 Years going away, no questions asked. That’ll be an easy winner. Best Animated Feature, Frozen. Everybody’s going to have that. That’s easy. Cinematography. Also easy. Gravity. Best Original Score is Gravity as well. There’s another eight or 10 to make you happy. That’s about my limit right there. AVC: One more pool question. The tiebreaker question: What time will it end? 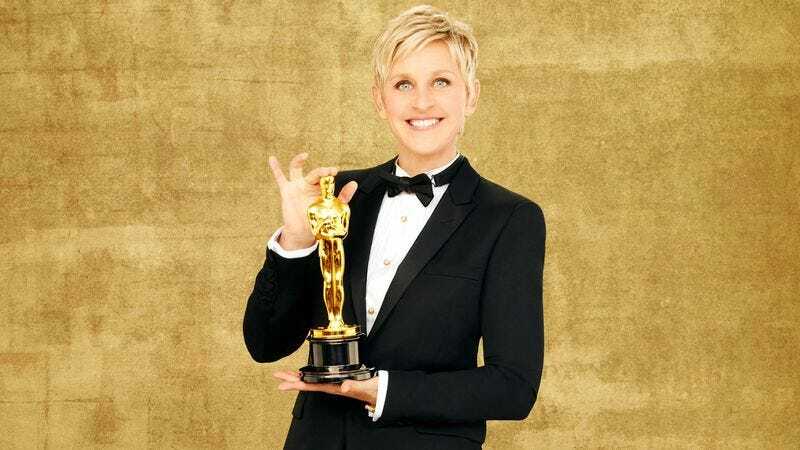 BE: Ellen DeGeneres is hosting. She’s pretty good. What is it usually, like eight to 11:30 East Coast? Do they have an over-under? Before 11:30, after 11:30? What is the choice? BE: I don’t know. That’s one that my guess is as good as your guess. You can do research on that. The Billy Crystal shows could have gone way long. The Johnny Carson shows, Bob Hope back in the day, could have gone way short. This year they’re doing a lot of singing, which they have done the last couple years. I would go closer to midnight. 11:53, something in that area. AVC: One more question. Are there odds already on the 2015 Oscars? BE: Not that I’ve seen. Some knucklehead might be making something out there, but I have not seen anything. We kind of don’t even know yet what films are going to be out there. They’ve talked about some films and some dates and some big blockbusters, but those tend to get moved. Instead of coming out in 2015, they’ll push it to 2016. So the answer to that is a big fat no.